"Cork County" redirects here. For the former UK Parliamentary constituency, see Cork County (UK Parliament constituency). County Cork (Irish: Contae Chorcaí) is a county in Ireland. It is the largest and southernmost county of Ireland, situated in the province of Munster and named after the city of Cork, Ireland's second-largest city. The Cork County Council is the local authority for the county. Its largest market towns are Mallow, Macroom, Midleton, and Skibbereen. In 2016, the county's population was 542,868, making it the third-most populous county in Ireland. Notable Corkonians include Michael Collins, Jack Lynch, and Sonia O'Sullivan. Cork borders four other counties; Kerry to the west, Limerick to the north, Tipperary to the north-east and Waterford to the east. The county contains the Golden Vale pastureland and stretches from Kanturk in the north to Allihies in the south. The south-west region, including West Cork, is one of Ireland's main tourist destinations, known for its rugged coast, megalithic monuments, and as the starting point for the Wild Atlantic Way. The county is known as the "Rebel county", a name given to them by King Henry VII of England for its support of a man claiming to be Richard, Duke of York in a futile attempt at a rebellion. The main third-level educator is University College Cork, founded in 1845, and with a current undergraduate population around 15,000. Significant local industry and employers include technology company Dell EMC, the European headquarters of Apple, and Dairygold, which own milk-processing factories in Mitchelstown and Mallow. Two local authorities have remits which collectively encompass the geographic area of the county and city of Cork. The county, excluding Cork city, is administered by Cork County Council, while the city is administered separately by Cork City Council. Both city and county are part of the South-West Region. For standardized European statistical purposes, both Cork County Council and Cork City Council rank equally as first-level local administrative units of the NUTS 3 South-West Region. Thirty-four such LAU 1 entities are in the Republic of Ireland. 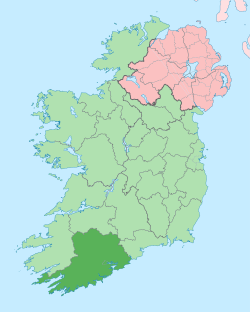 For elections to Dáil Éireann, the county is divided into five constituencies—Cork East, Cork North-Central, Cork North-West, Cork South-Central and Cork South-West. Together they return 18 deputies (TDs) to the Dáil. The county is part of the South constituency for the purposes of European elections. County Cork is located in the province of Munster, bordering Kerry to the west, Limerick to the north, Tipperary to the north-east and Waterford to the east. It is the largest county in Ireland by land area, and the largest of Munster's six counties by population and area. At the last census in 2016, Cork city stood at 125,657. The population of the entire county is 542,868 making it the state's second-most populous county and the third-most populous county on the island of Ireland. The remit of Cork County Council includes some suburbs of the city not within the area of Cork City Council. Twenty-four historic baronies are in the county—the most of any county in Ireland. While baronies continue to be officially defined units, they are no longer used for many administrative purposes. Their official status is illustrated by Placenames Orders made since 2003, where official Irish names of baronies are listed. The county has 253 civil parishes. Townlands are the smallest officially defined geographical divisions in Ireland, with about 5447 townlands in the county. 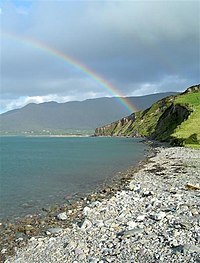 The county's mountain rose during a period mountain formation some 374-360 million years ago and include the Slieve Miskish and Caha Mountains on the Beara Peninsula, the Ballyhoura Mountains on the border with Limerick and the Shehy Mountains which contain Knockboy (706 m), the highest point in Cork. 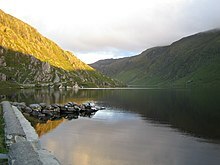 The Shehy Mountains are on the border with Kerry and may be accessed from the area known as Priests Leap, near the village of Coomhola. The Galtee Mountains are located across parts of Tipperary, Limerick, and Cork and are Ireland's highest inland mountain range. The upland areas of the Ballyhoura, Boggeragh, Derrynasaggart, and Mullaghareirk Mountain ranges add to the range of habitats found in the county. Important habitats in the uplands include blanket bog, heath, glacial lakes, and upland grasslands. Cork has the 13th-highest county peak in Ireland. Three rivers, the Bandon, Blackwater, and Lee, and their valleys dominate central Cork. [original research?] Habitats of the valleys and floodplains include woodlands, marshes, fens, and species-rich limestone grasslands. The River Bandon flows through several towns, including Dunmanway to the west of the town of Bandon before draining into Kinsale Harbour on the south coast. Cork's sea loughs include Lough Hyne and Lough Mahon, and the county also has many small lakes. An area has formed where the River Lee breaks into a network of channels weaving through a series of wooded islands. About 85 hectares of swamp are around Cork's wooded area. The Environmental Protection Agency carried out a survey of surface waters in County Cork between 1995 and 1997, which identified 125 rivers and 32 lakes covered by the regulations. Cork has a mountainous and flat landscape with many beaches and sea cliffs along its coast. The southwest of Ireland is known for its peninsulas and some in Cork include the Beara Peninsula, Sheep's Head, Mizen Head, and Brow Head. Brow Head is the most southerly point of mainland Ireland. There are many islands off the coast of the county, in particular, off West Cork. Carbery's Hundred Isles are the islands around Long Island Bay and Roaringwater Bay. 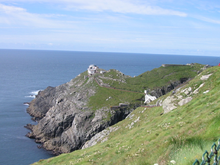 Mizen Head is the most south-westerly point of both Cork and Ireland. Fastnet Rock lies in the Atlantic Ocean 11.3 km south of mainland Ireland, making it the most southerly point of Ireland. Many notable islands lie off Cork, including Bere, Great, Sherkin, and Cape Clear. Cork has 1,094 km of coastline, the second-longest coastline of any county after Mayo, which has 1,168 km. Like many parts of Munster, Cork has fertile agricultural land and many bog and peatlands. Cork has around 74,000 hectares of peatlands, which amount to 9.8% of the county's total land area. And the county contains around 79,188 ha (195,680 acres) of forest and woodland area, or 10.5% of Cork's land area, higher than the national average of 9%. The hooded crow, Corvus cornix is a common bird, particularly in areas nearer the coast. Due to this bird's ability to (rarely) prey upon small lambs, the gun clubs of Cork County have killed a large number of these birds in modern times. A collection of the marine algae was housed in the herbarium of the botany department of the University College Cork. Parts of the South West coastline are hotspots for sightings of rare birds, with Cape Clear being a prime location for bird watching. The island is also home to one of only a few gannet colonies around Ireland and the UK. The coastline of Cork is sometimes associated with whale watching, with some sightings of fin whales, basking sharks, pilot whales, minke whales, and other species. County Cork has two Gaeltacht areas where the Irish language is the primary medium of everyday speech. These are Múscraí (Muskerry) in the north of the county, especially the villages of Cill Na Martra (Kilnamartyra), Baile Bhúirne (Ballyvourney), Cúil Aodha (Coolea), Béal Átha an Ghaorthaidh (Ballingeary), and Oileán Chléire (Cape Clear Island). There are 14,829 Irish language speakers in County Cork with 3,660 native speakers in the Cork Gaeltacht. In addition, there are 6,273 who attend the 21 Gaelscoileanna and six Gaelcholáistí all across the county. According to the Irish Census 2006 there are 4,896 people in the county who identify themselves as being daily Irish speakers outside of the education system. Ballingeary is a centre for Irish language tuition, with a summer school, Coláiste na Mumhan, or the College of Munster. There are several media publications printed and distributed in County Cork. These include the Irish Examiner (formerly the Cork Examiner) and its sister publication The Echo (formerly the Evening Echo). Local and regional newspapers include The Cork News, Carrigdhoun, the Cork Independent, The Corkman, the Mallow Star, the Douglas Post, the East Cork Journal and the Southern Star. Fota Island is the only wildlife park in Ireland, Fota House and Gardens, and the Fota Golf Club and Resort; a European Tour standard golf course which has also hosted the Irish Open in 2001, 2002 and 2014. West Cork is known for its rugged natural environment, beaches and social atmosphere and is a destination for British, German, French and Dutch tourists. The Golden Vale is among the most productive farmland for dairy in Ireland. The chief milk processor is Dairygold, a farmer-owned co-operative based in Mitchelstown, who process 1.4 billion liters a year, converting the milk into cheeses and powder dairy nutritionals for infant formula. Cork city is the only city in the county and the second most populous city in the Republic of Ireland, with a population of 125,657 according to the 2016 census. Cork city is the third most populous city on the island of Ireland. According to the 2006 Census statistics, the county has 11 towns with a population of over 4,000. The county has a population density of 72 persons/km2. A large percentage of the population live in urban areas. Common surnames in the county include Barry, Buckley, Callaghan, Connell, Connor, Crowley, Lynch, McCarthy, Murphy, O'Leary, O'Sullivan, Sheehan, Walsh, and Fitzgerald (the latter with a Norman derivation). ^ a b c d e f "Census 2016 Sapmap Area: County Cork City". Central Statistics Office (Ireland). Retrieved 18 November 2018. ^ a b c d "Census 2016 Sapmap Area: County Cork County". Central Statistics Office (Ireland). Retrieved 18 November 2018. ^ "Placenames Database of Ireland. Retrieved January 21, 2012". Logainm.ie. 13 December 2010. Retrieved 23 May 2012. ^ Planet, Lonely (14 January 2011). "Cape Clear Island: a birdwatching bonanza". Lonely Planet. Retrieved 18 November 2017. ^ Ireland, BirdWatch. "Cape Clear Bird Observatory". www.birdwatchireland.ie. Retrieved 18 November 2017. ^ Whooley, Pádraig. "Wild waters: the lesser-known life of whales and dolphins along the Irish coastline". The Irish Times. Retrieved 18 November 2017. ^ Fáilte Ireland. "Whale Watching & Dolphin Watching in Ireland – Wild Atlantic Way". www.wildatlanticway.com. Retrieved 18 November 2017. ^ Jones, Calvin (23 August 2016). "How to watch whales and dolphins – whalewatching tips and advice". Ireland's Wildlife. Retrieved 18 November 2017. ^ for post 1821 figures 1653 and 1659 figures from Civil Survey Census of those years Paper of Mr Hardinge to Royal Irish Academy March 14, 1865 For a discussion on the accuracy of pre-famine census returns see JJ Lee “On the accuracy of the pre-famine Irish censuses” in Irish Population Economy and Society edited by JM Goldstrom and LA Clarkson (1981) p54 in and also New Developments in Irish Population History 1700–1850 by Joel Mokyr and Cormac Ó Gráda in The Economic History Review New Series Vol. 37 No. 4 (November 1984) pp. 473–488. ^ "Rebelcork.com". Rebelcork.com. Archived from the original on 2 April 2012. Retrieved 23 May 2012. ^ "Corkindependent.com". Corkindependent.com. 27 August 2009. Archived from the original on 21 August 2010. Retrieved 23 May 2012. ^ "Thecorknews.ie". Thecorknews.ie. 19 April 2012. Retrieved 23 May 2012. ^ "Cork / Kerry GDP" (PDF). Central Statistics Office. Archived from the original (PDF) on 19 November 2011. ^ "Dairygold opens €85m facility at Mallow headquarters". RTÉ. 22 September 2017. Retrieved 16 November 2017. ^ "Population Density and Area Size 2016". Central Statistics Office (Ireland). Retrieved 26 December 2017. ^ "Census 2016 Sapmap Area: Electoral Division Ballincollig". Census 2016. Central Statistics Office. Retrieved 26 December 2017. ^ a b "County Cork (CSO Area Code CTY 18)". Census 2011. Central Statistics Office. Retrieved 5 April 2019. ^ "Popular Cork surnames and families". Rooteireland.ie. Retrieved 26 June 2018. ^ "CORK". John Grenham. Retrieved 26 June 2018. ^ "Cork". 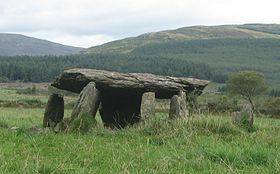 irishgenealogy.com. Retrieved 26 June 2018. Wikimedia Commons has media related to County Cork. Wikisource has the text of an 1879 American Cyclopædia article about County Cork. Wikivoyage has a travel guide for County Cork.